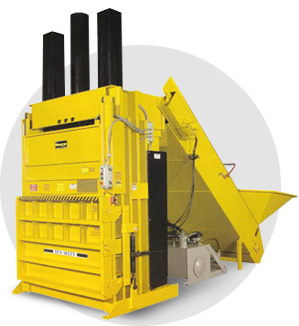 The System Ten Sixty applies speed and power to vertical baling, bridging the productivity gap between vertical balers and horizontal balers by producing extremely dense bales for a fraction of the cost of a horizontal baler. Fed via conveyor, the System Ten Sixty greatly speeds up the processing of newsprint, PET/HDPE bottles and steel/aluminum cans. 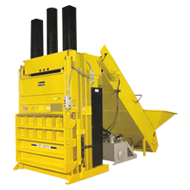 Its fast 30 second cycle time and (3) sets of bale dogs allows bulk material such as cardboard to be baled quickly in the traditional manner. Powered by a 10 inch cylinder generating over 235,000 lbs. of force, the System Ten Sixty produces bale densities comparable to those of the largest horizontals.